IN THE FALL OF 2002 BEGINNINGS WAS BORN OUT OF THE LOVE AND RESPECT FOR THE MUSIC OF ONE OF THE GREATEST AMERICAN ROCK BANDS OF ALL TIME – CHICAGO. 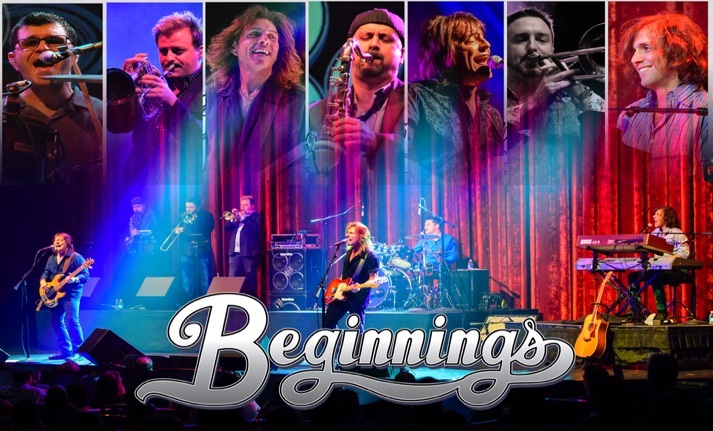 FORGED TOGETHER BY A GROUP OF PROFESSIONAL MUSICIANS, ALL VETERANS OF THE NEW YORK MUSIC SCENE, BEGINNINGS, LIKE CHICAGO, WAS A LABOR OF LOVE BASED ON MUSICIANSHIP AND PROFESSIONALISM. BUT A FUNNY THING HAPPENED ON THE WAY TO CARNEGIE HALL… A COLLABORATION BLOSSOMED INTO A NON-STOP MUSICAL ODYSSEY. BEGINNINGS IS TIGHTLY WOVEN STRUCTURE OF INTELLECTUAL MUSICAL TALENT RARELY SEEN IN TODAY’S MUSIC WORLD, EITHER IN THE ORIGINAL OR TRIBUTE ARENAS. THEY ARE INDIVIDUALLY TALENTED MUSICIANS WHO TOGETHER COMPRISE AN EVER EVOLVING UNIVERSE OF MUSICALITY THAT ENCOMPASSES MULTI-INSTRUMENTALISTS AND MULTIPLE LEAD VOCALISTS. QUITE SIMPLY, THEY ARE A BAND LIKE NO OTHER. THIS DEPTH OF TALENT IS FOCUSED ON THE BAND CHICAGO, WHOSE SONG BOOK SPANS MORE THAN FORTY YEARS, AND INCLUDES FIVE NUMBER 1 ALBUMS AND TWENTY TOP TEN HITS. THEIR PERFORMANCES BRING TO LIFE THE MUSIC OF CHICAGO, AND EXCEPTIONALLY RECREATE EVERY DECADE OF THE BAND’S HITS. BEGINNINGS IS A FAMILY FRIENDLY MELODIC ADVENTURE, PLEASING TO MUSIC LOVERS OF ALL AGES. BEGINNINGS INVITES YOU TO MAKE TIME TO COME OUT AND HEAR THE BAND. THEY KNOW IT WILL BE ONE OF THE MOST ENJOYABLE AND ENTERTAINING SHOWS YOU WILL EVER SEE. THE MUSIC OF CHICAGO IS TRULY WONDERFUL – TIMELESS CLASSICS THAT DEFINE GENERATIONS – ESPECIALLY WHEN PERFORMED BY THIS TALENTED GROUP OF MUSICIANS – BEGINNINGS.